I've been trying out an e-ink reader for my academic work. "e-ink" - these are greyscale LCD-like displays. You see the image by light reflectance, almost the same way you read a printed page, not by luminance like a TV/laptop screen. This should be better in lots of ways: better on your eyes, low-power, and you can read outside. The low-power comes because it doesn't need a full jolt of energy 50 times a second as does an LED display: if the image doesn't change, no power is needed, the image stays there for free. Why for academic work? A LARGE portion of my everyday work consists of looking at academic article PDFs, scribbling on them, then giving/implementing feedback. This comes from students, collaborators, reviews for journals/conferences, and from editing my own work as I do it. Some people can do this kind of stuff directly on a laptop screen. I'm afraid I can't. It's less effective, less detailed when I do that - so, for years, I've been printing things out, scribbling notes on them, then throwing them away afterwards. If an e-ink reader can replace all that, maybe that's a good thing for the environment? Note: it takes a lot of resources to build an e-reader. At what point is it "better" to print thousands of pages of paper, versus manufacture one e-reader? I don't know. 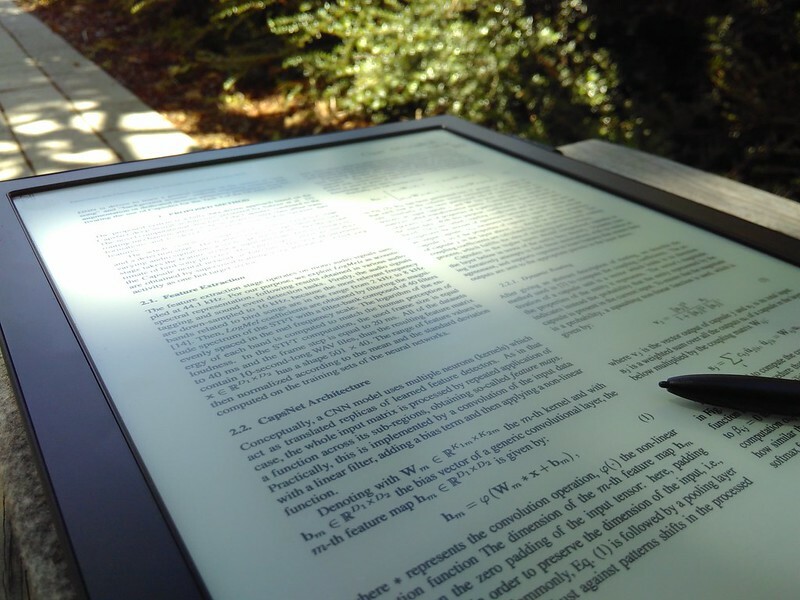 You can't use any old e-reader, for academic reviewing: it needs to be large enough to render an A4 PDF well (ideally, full A4 size), and needs some way of annotating. This one I'm trying has a stylus that you can use to scribble, and it works. Surprisingly good so far. We sometimes have sunny days, you know. For some reason this often happens when we've a workshop or conference organised. "Why don't we have the session outside on the grass?" I'm tempted to say. The answer would be... because you can't really look at people's slideshow slides out on the grass. Pass a laptop around? Broadcast the slides to everyone's smartphones? Redraw everything from scratch on a flipchart? Meh. What I'd like to see is an e-ink screen, large enough to host a seminar with. The resolution doesn't need to be as high as all that, certainly doesn't need to be as high as is needed for reviewing PDFs. it just needs to be big. It would be great if there was a stylus or some other way of scribbling on the screen too.